From experimental studies a correlation has been found between seeing (gazing at) a product and product evaluation (as well as choice). 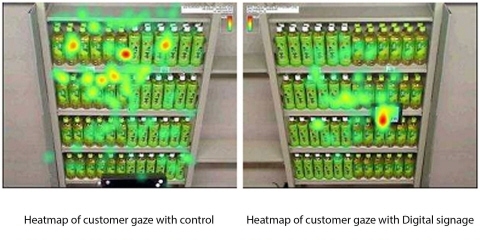 The Morigucki Takeshi Laboratory at Waseda University explored this phenomenon with eye tracking using in store signage, finding the key to point of sale promotion for novel product groups. In previous research Professor Shinsuke Shimojo at the California Institute of Technology validated the hypothesis that the "liking because of looking" mechanism exists by comparing gaze time with favorable feelings. At Waseda University Graduate School of Commerce the Takeshi Moriguchi Laboratory decided to apply this "liking because of looking" mechanism to sales promotion. Digital signage (electronic signboards) is an eyecatching sales promotion tool which increases the visibility of products to end consumers. Main objective was to make a comparison between three promotional conditions at point of purchase and reveal the effects of visual attention paid to digital signage and on product choice probability. Also to test the validity of the “Liking because of looking”-phenomenon with the same point of Sale promotion tools. Eye Tracking is an optimal tool for measuring the latent, unconscious buying process of consumers, and this technology is really making consumer measurements easier. The experiment was conducted using a Tobii X120 Eye Tracker on the two product categories: green tea and oxygen water, measuring how consumers looked at a shelf of cans in a store environment. For the green tea product category the target product "Kirin Nama-cha" was compared with "Itoen oi-ocha". Both well known, equally favored products within this popular product category. For oxygen water the target product is called "Sangaria Sawayaka Oxygen Water", and its comparison "Nihon Shokken Oxygen Water Plus". Oxygen water is a novel product category with a low recognition rate; such that almost no one that took part in the experiment had ever purchased any of either the target product or the comparison product. Control condition without any promotion on the shelf. Point Of Purchase (POP) condition with printed promotion. 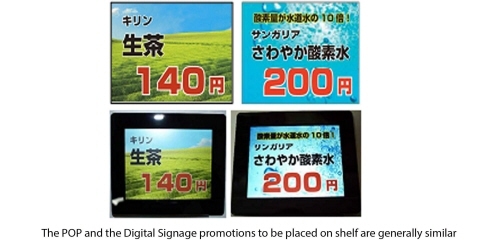 Digital Signage condition with digital signs. The signs were made with the same design and size as the printed POP promotions, the only difference being a moving background and audio. The Tobii eye tracker is excellent because of its ease of use and its native measurement capabilities. It has a smooth calibration and allows for the possibility of screening the quality of gathered data. Tobii Pro Studio software, was used to analyze the acquired gaze data. According to the gaze time measured by Pro Studio, researchers could confirm a change in consumer gaze time when digital signage promotion was used, as well as a change in the time spent visually perceiving the target product, compared to those of the control condition and the POP condition. In both of the product categories a statistically significant difference was found between the different stimulus conditions. For green tea customers who chose the target brand, there was no noticeable difference in the gaze time induced by POP and digital signage. On the other hand, for oxygen water, the gaze time for people who chose the target product was about 2 times bigger for POP promotion, and 7 times bigger for digital signage stimuli. The green tea results were not statistically significant, but for the oxygen water product group the digital signage promotional stimulus conditions did create a statistically significant difference in the final probability of choosing the target product over the comparison product. The reason for the difference between the two product categories was most likely that green tea is a highly purchased product category; as such, consumers may have already formed personal preferences. Therefore, even if digital signage promotion attracts the consumers' gaze, no influence was found on the final product choice. However, in case of oxygen water, a product category in which consumers have almost no purchase experience, attracting the gaze of a consumer can be linked directly to consumer preference. This being so, it can be said that digital signage has a statistical influence on product choice and that liking because of looking can be highly influenced in novel product categories.